Have Your Carbs, and Eat Them Too! Perfect for minimizing the effects of carbohydrates and supporting fat loss. By adding this dietary supplement to your morning you can keep your blood sugar balanced... for less than $1 per day! And, it is backed with our "365 Day Guarantee." 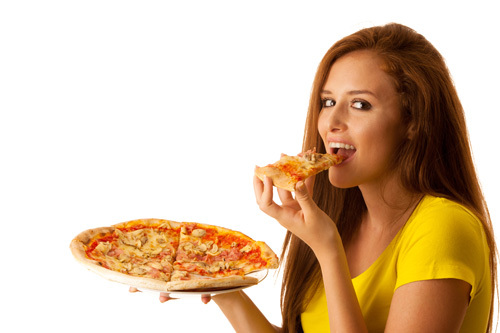 Eat Pizza Without the GUILT! My name is Steve Justice and I am hoping to share some valuable information with you. If you are like me, you love your carbs! Pizza! Pasta! Pastries! Oh my!! What's better than some warm bread with melting butter at dinner and then a piece of banana cream pie for dessert? ...Disrupting many of the healthy functions of your body. Even worse... In addition to the obvious foods where sugar lurks, manufacturers are putting more and more sugar in foods like tomato sauce and peanut butter! And you know about the "Low-Fat" craze, that's supposed to be healthier for you? Well, they take out the fat (eating fat makes you feel full and stop eating...) and they ADD MORE SUGAR!! Are you kidding me—how do you win?? For me, I came from a family that loves to have desserts after every meal... and that's after a BIG breakfast most days of waffles, pastries or cinnamon rolls. As my wife, Ashley, and I started our family we built meals into our routine and our bonding time. Eventually, with four teenage boys, the amount of food we were going through was insane! And, even though I like to think I have pretty good willpower, there is no way I could say no in every situation. So, if the boys ate a few cookies after supper, I joined in. If Ashley made an apple pie for dessert, sure I had a slice (but with only one scoop of ice cream!)... well you get the picture. Every carbohydrate I ate seemed to stick to my belly. Five pounds became 10, and 10 pounds turned into 15. Not only did I dislike the way I was beginning to look (I had to wear “slimming” black shirts more and more often), I was starting to feel lethargic and tired. Additionally, the more I read up on the effects of carbs, the more it scared me—heart attacks, strokes, diabetes, cancer....and on and on. But, here's the thing—as much as I understood all of the bad things that could happen if I continued to eat too many carbs and had too much sugar, I still had a hard time stopping. Studies have shown SUGAR is MORE ADDICTING than COCAINE!!! Fatal admission here... I have a sweet tooth. And not just a small desire for a bite of dessert after a meal. I CRAVE foods with sugar in it! Long story short, limiting my carbs meant limiting my ability to enjoy time with my family. I needed a simple solution.....which is what led to a conversation with Dr. Scott Saunders, who knows the inner workings of the human body about as well as anyone on the planet! Dr. Saunders has been a good friend for years and he understood my problem. He also had a good grasp on the research out there that involved minimizing the effects of carbohydrates and sugar on your body. Dr. Saunders has dealt with THOUSANDS of patients with this very issue and I knew he would have some ideas. Even though I have a lot of knowledge of health and wellness and I have taken supplements and used natural remedies for years. I was still amazed at how little I understood about some of the well-researched and NATURAL compounds that can help people who love their carbs like I do. He formulated it using the exact ingredients he wanted for his own patients who struggled with metabolic issues and diabetic symptoms. And he formulated it for people like us &dash; with a sweet tooth! The two primary ingredients are cinnamon bark extract and chromium picolinate &dash; two metabolic powerhouses!! Plus, there are four other ingredients that Dr. Saunders INSISTED to include in CinnaChroma — Vitamin D3, Vitamin K2, Vanadium and Selenium. As Dr. Saunders started explaining this to me, he was getting more excited by the minute...and so was I! The amount of extremely positive findings from major clinical studies was overwhelming! The six ingredients in CinnaChroma will help you be able to have your carbs, keep your sweet tooth, and get rid of the blood sugar blues. This magical spice has been used for thousands of years by populations around the world for therapeutic purposes. For centuries, people traversed the globe in search of access to this spice... and we now know why—it has an abundance of properties known to facilitate health that are only now starting to be fully understood. 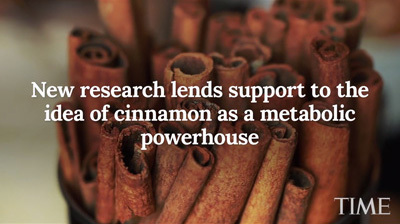 The article championed cinnamon a "metabolic powerhouse" and noted that it prevents sugar spikes and insulin resistance. One clinical study found that cinnamon supplementation alone reduced blood glucose by up to 29% in just 40 days! Another study found that cinnamon supplementation lowered HbA1c by 10% in just 90 days! 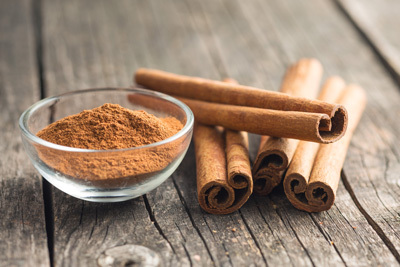 Hundreds of other studies over the years have validated cinnamon bark extract's ability to help keep you healthy and to offset the effect of carbohydrates. However, you aren't going to get enough cinnamon from your spice rack &dash; the amount you normally sprinkle on your toast isn't nearly enough to help. CinnaChroma includes the amount you need (and clinical studies confirmed) to be most effective. 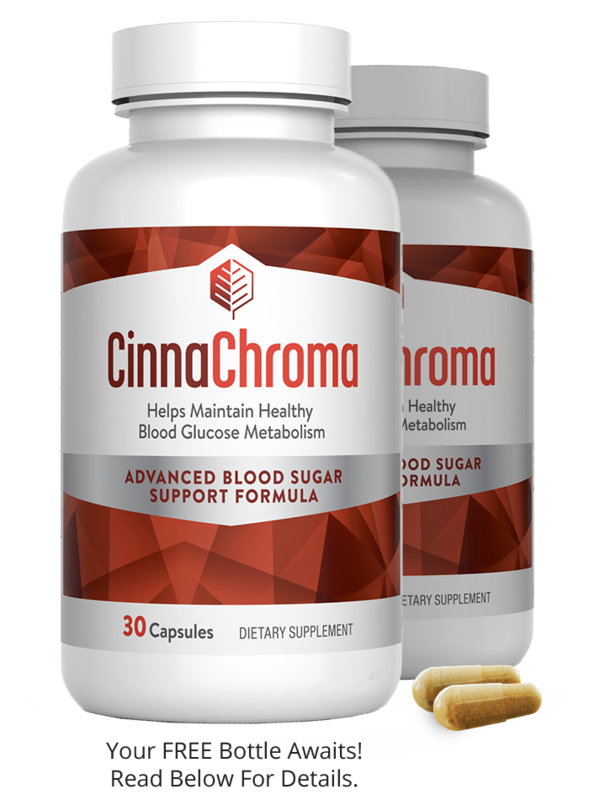 Cinnamon bark extract is one of the most powerful antioxidants on the planet and CinnaChroma contains this magical spice in a highly refined form. Until the 1960s, it was not fully understood that chromium is ESSENTIAL to the regulation of insulin and blood sugar within the body. However, approximately 98% of ingested chromium is excreted from the body without being utilized, which contributes to a deficiency risk for many people! 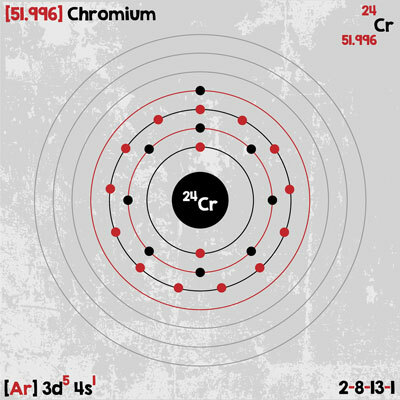 The addition of picolinate to the compound allows greater bioavaibility for the chromium to more effectively ensure that proper levels are maintained. Picolinate is what is called a “chelator,” which simply means that without that, chromium (and a lot of other vital minerals) are nearly useless in your body. Chelators help minerals pass from your digestive track to your cells--where the magic happens! Without chelators, minerals will often pass straight through the body with minimal absorption. A recent randomized, clinical study found that Chromium Picolinate reduced fasting blood glucose by 300% and reduced post-meal blood glucose by 200% compared to a control group. Although some companies have made wild fat loss and muscle building claims about Chromium Picolinate, the simple fact is that Chromium is key for insulin sensitivity and regulation of blood sugar. Two key super vitamins are also included in CinnaChroma to provide additional benefits related to glucose regulation. More research is being generated by the day about this miraculous natural vitamin, which acts more like a regulatory hormone. Once understood to mainly regulate bone growth and healing, it has been proven more recently to exhibit enormous influence on a huge number of biological processes, including moderating the immune system and how your body processes glucose and insulin. 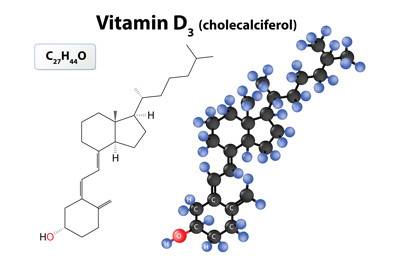 A recent large study in China found a clear correlation between low Vitamin D3 levels and a wide range of health issues—cardiovascular disease, liver problems, osteoporosis and diabetes! Although the RDA of Vitamin D3 has historically been 200-800 IU, depending on age, more recent research and recommendations by the Vitamin D3 Council suggests that the average adult needs at least 5,000 IU per day to maintain optimal health! With these guidelines, estimates are well over half of all Americans could be deficient in Vitamin D3! Although the research is continuing to hone in on the exact role of Vitamin D3 in overall health, it appears that even a slight deficiency of this vitamin can be a major issue... and CinnaChroma has enough to ensure that your Vitamin D3 levels stay elevated! 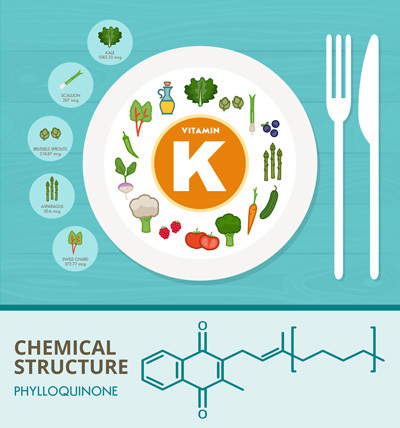 Another key component to CinnaChroma is a little-known vitamin that is not present in most other supplements—Vitamin K2. K2 is helpful in reducing the inflammation that often accompanies elevated blood sugar and has been shown to have protective effects as well that benefit overall health. However, K2 is an important variable that works in conjunction with Vitamin D3 to ensure your body uses it effectively and properly. Think of Vitamin K2 as the traffic cop for D3--it directs it where to go and helps to tell it what to do. In one of the longest standing studies on generational health over 40+ years, higher serum levels of vitamins D and K were associated with positive results on important health measures, suggesting that together the two vitamins are a powerful protective duo. Vanadium is a powerful trace element that mimics the action of insulin. It helps move glucose from the blood into the cells, to be used for energy. It has been poorly understood by scientists and doctors until recently. In conjunction with Chromium, Vanadium has been reported to help improve the body's use of insulin and to lower glucose levels. Once glucose levels are reduced, less fat is retained in the belly, which is something we all want! Mineral deficiencies cause sugar cravings &dash; so Dr. Saunders recommends adding 200 mcg of Vanadium to your day. As your sweet tooth cravings diminish, watch as the stubborn extra pounds of belly fat will melt off! Gentle enough to be included in infant formulas, Selenium is another trace element nutrient that has been largely ignored until more recently. It has been demonstrated to have a positive effect on the immune system and facilitates the regeneration of glutathione, the "king of anti-oxidants." Recent studies also suggest a strong connection between Selenium and the ability to regulate longer-term glucose metabolism. Many of the diseases we face in the modern world are due to inflammation, including cancer, heart disease, arthritis, and diabetes. Selenium can improve function and prevent degeneration, or aging by lowering inflammation. We are told that it is normal to "get old" and have memory loss, diabetes, arthritis, or even heart disease. Actually, we don’t have to decline in function; we can continue to improve if we care for our bodies well. By removing inflammation inside the cells, they function better, and are more able to regenerate, preventing aging. Selenium even prevents the peroxides in hair cells that cause us to get gray hair. Getting adequate selenium is an important part of any anti-aging program. Fast forward to now. My wife, Ashley, and I have been taking CinnaChroma for a while and the results have been nothing short of amazing. Have my carbs and eat them too! 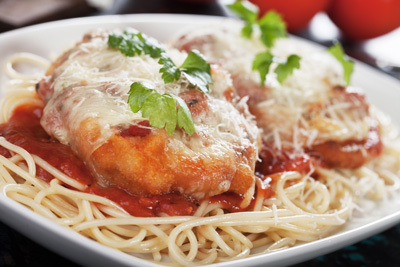 And here is the best result of all: our whole family was sitting around the table after Sunday dinner last week (Chicken parm... my favorite!) with some good conversation — and for teenage boys that's saying something! 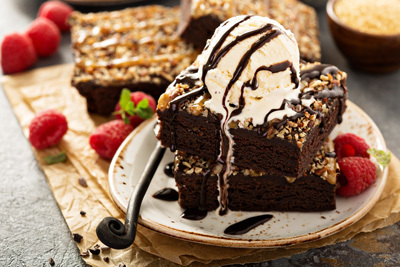 Just as the boys were about to scatter to the wind, Ashley announced, "I made your favorite—chocolate caramel brownies with vanilla ice cream!" Of course they stayed glued to their chairs and I was SO content that I got an extra 15 minutes with my family...and a scrumptious dessert! Thank you for taking the time to listen to my story. I sincerely believe CinnaChroma can help most people and I think you will be pleased if you take the next step. Who is CinnaChroma NOT For? Anyone who is already getting sufficient amounts of chromium picolinate, cinnamon bark extract, vitamin D3, vitamin K2, selenium AND vanadium in their diets. Don't get me wrong &dash; I love doctors! I'm thankful for those who have dedicated their lives to helping people overcome injury, sickness and disease! Unfortunately, most doctors never learn about the amazing benefits of nutritional supplementation when they attend medical school. They really only learn about the thousands of different prescription medications that treat the symptoms of disease, but never get to the root cause. 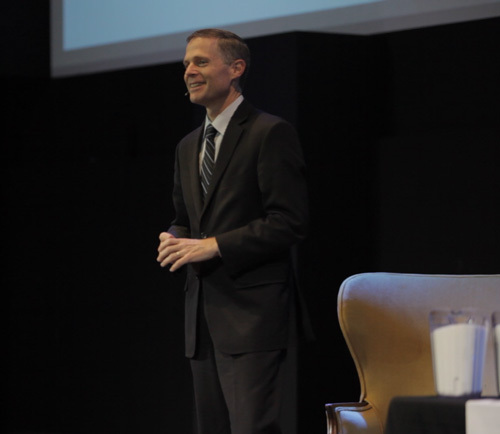 Dr. Scott Saunders was a doctor in the UCLA medical system for several years, but he realized quickly that his job was not designed to help people get healthy, but to help people take prescription medications. He didn't have time to visit his patients and get to know them. He was given less than 9 minutes to see each patient throughout his hectic day. Dr. Saunders started studying natural health journals and studying the effects of functional medicine &dash; which looks to find the root cause of disease, and then apply integrative health practices to help his patients actually get well. He had to leave the UCLA medical system to start his own practice, and it wasn't until then that he began to see amazing transformations in his patients. Through his practice, he has helped hundreds of people reverse Type II Diabetes, Pre-diabetes, and Metabolic Syndrome. Living in Los Angeles, he became sought after by famous celebrities, including one of the most popular musicians of all time. (You can ask Dr. Saunders who that is if you ever get the chance to speak with him!). What I find most exciting is all the testimonials we hear from regular, everyday people who use these natural remedies, experience positive health transformation, and then go back to their traditional doctor reporting the results. Almost every doctor has the same answer: "I'm not sure how it's working, but whatever you're doing, KEEP DOING IT!" There is absolutely ZERO risk when you try CinnaChroma. If you are not 100% satisfied... for any reason... at any point, we will provide you a full refund of your purchase price (minus shipping)! I don't think we can be any more fair than taking away all your risk! Q: Why is CinnaChroma the best supplement available for glucose and carbohydrate management? CinnaChroma contains a proprietary blend of ingredients that all have been the subject of intensive scientific research. This product provides ​optimal ​levels ​as ​​recommended by Dr. Scott Saunders to his friends, family and patients. It is manufactured in an FDA registered facility in the United States of America by a company that conforms with GMP (Good Manufacturing Practice) standards. Q: What is the exact formulation for CinnaChroma? Below is the actual bottle label with exact amounts of each ingredient included. Q: How long do I need to take CinnaChroma to determine if it is working? To put it simply, everyone is different so there is no standard answer. While it's common to experience immediate benefits when taking supplements like CinnaChroma, scientific studies and real-world experience suggest that results are more gradual and improve over time. Therefore, our recommendation is to enroll in our automatic delivery option and use the product for at least 6 months before you make a final decision. WIth our 365 day money-back guarantee, you can always return what you don't use if you decide CinnaChroma isn't right for you. Q: When should I take CinnaChroma? 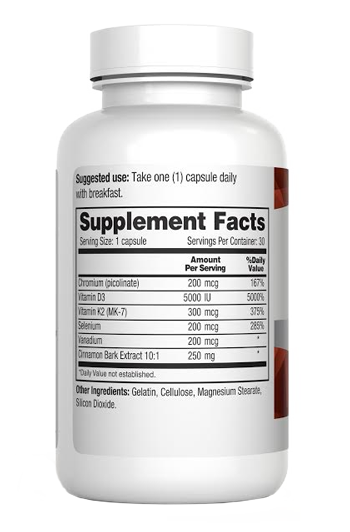 Take one (1) capsule daily with breakfast, or with your first carbohydrate-containing meal of the day. Q: Does CinnaChroma contain any stimulants such as caffeine or ephedrine? Absolutely not. This product is caffeine–free and stimulant–free and contains only natural ingredients designed to address blood glucose levels. Q: Should I take CinnaChroma if I am taking medications or have a medical condition? CinnaChroma is well tolerated by most people and is intended for use by healthy adults 18+ years of age. If you have any concerns about other medications or medical conditions you should ALWAYS consult with your physician. Discontinue use immediately and consult your physician if you experience any adverse reaction to this product. Q: How quickly will I receive CinnaChroma after my order is placed? You should receive your order within five (5) business days in the continental U.S. International orders may take longer but we can ship to most places around the world, if needed. Q: How does the free bottle/trial option work? The Free Bottle Offer enters you into the CinnaChroma Easy Autoship Program. You'll receive a 30-day supply of CinnaChroma every month, so you never run out! Each bottle will ship at the discounted price of just $35 + $6.95 shipping. Cancel anytime by calling our awesome support team at (866) 942-3288, during regular business hours, or simply email [email protected] We'll be standing by to help! Yes. We use a secure shopping cart where 100% of your data is encrypted and secure. Q: What if I have questions about the product? No problem at all. We have a responsive staff of customer support representatives who are ready to answer your questions. You can call us at 1-866-942-3288 or email us at [email protected] and we will respond quickly to your questions. Q: What if CinnnaChroma doesn't work for me? The human body is a complex piece of biological machinery and no two are alike. Therefore, we can't make promises that CinnaChroma will work for 100% of people who take the product. However, CinnaChroma was formulated by Dr. Saunders after rigorous study of scientific research and clinical studies. He recommends it to his family, friends and patients, and has watched them succeed. Plus, by having a 365-day empty-bottle money-back guarantee, you have virtually no risk. The International Institute for Diabetes Research (IIFDR) is an organization committed to promoting health and wellness for those with diabetes and pre-diabetes symptoms. Dr. Scott Saunders serves as the Chief Health Officer & Nutrition Advisor and supports practical and natural solutions to many of the diseases and disorders that afflict contemporary society. IIFDR encourages active engagement by individuals and empowers people to be successful in their personal health and wellness goals. Wang ZQ, Cefalu WT. Current concepts about chromium supplementation in type 2 diabetes and insulin resistance. Curr Diab Rep. 2010;10:145-151. Solomon TP, Blannin AK. Changes in glucose tolerance and insulin sensitivity following 2 weeks of daily cinnamon ingestion in healthy humans. Eur J Appl Physiol. 2009 Apr;105(6):969-76. Epub 2009 Jan 22. Ali A, Ma Y, Reynolds J et al. Chromium effects on glucose tolerance and insulin sensitivity in persons at risk for diabetes mellitus. Endocr Pract. 2011;17(1):16-25. Balk EM, Tatsioni A, Lichtenstein AH et al. Effect of chromium supplementation on glucose metabolism and lipids. Diabetes Care. 2007;30(8):2154-2163. Rafehi H, Ververis K, Karagiannis TC. Controversies surrounding the clinical potential of cinnamon for the management of diabetes. Diabetes Obes Metab.2012;14(6):493-499. Baker WL, Gutierrez-Williams G, White CM et al. Effect of cinnamon on glucose control and lipid parameters. Diabetes Care. 2008;31(1):41-43. 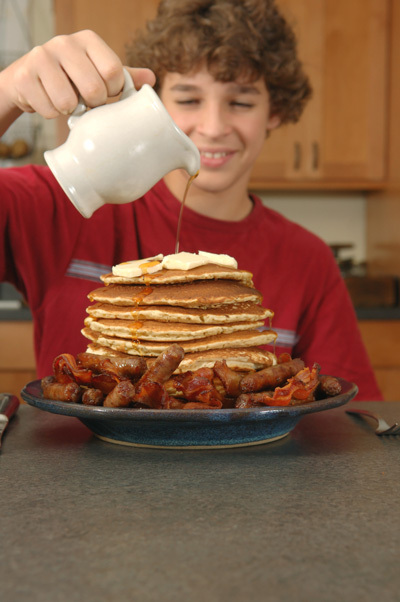 Davis PA, Yokoyama W. Cinnamon intake lowers fasting blood glucose: meta-analysis. J Med Food. 2011;14(9):884-889. Lee T, Dugoua J. Nutritional supplements and their effect on glucose control. Curr Diab Rep. 2011;11:142-148. Shea MK, O'Donnell CJ, Vermeer C, Magdeleyns EJ, Crosier MD, Gundberg CM, Ordovas JM, Kritchevsky SB, Booth SL. Circulating uncarboxylated matrix gla protein is associated with vitamin K nutritional status, but not coronary artery calcium, in older adults. J Nutr. 2011 Aug;141(8):1529-34. Srivastava, Ashok K. "Anti-diabetic and toxic effects of vanadium compounds." Molecular and cellular biochemistry 206.1-2 (2000): 177-182. Thompson, Katherine H., et al. "Vanadium treatment of type 2 diabetes: a view to the future." Journal of inorganic biochemistry 103.4 (2009): 554-558. Mueller A.S., Mueller K., Wolf N.M., Pallauf J. Selenium and diabetes: An enigma? Free Radic. Res. 2009;43:1029–1059. Jablonska E, Reszka E, Gromadzinska J, et al. The Effect of Selenium Supplementation on Glucose Homeostasis and the Expression of Genes Related to Glucose Metabolism. Nutrients. 2016;8(12):772.